Why drive or hike when you can get to the top of the highest peak in the Northeast on the World's First Mountain-Climbing Cog Railway train. 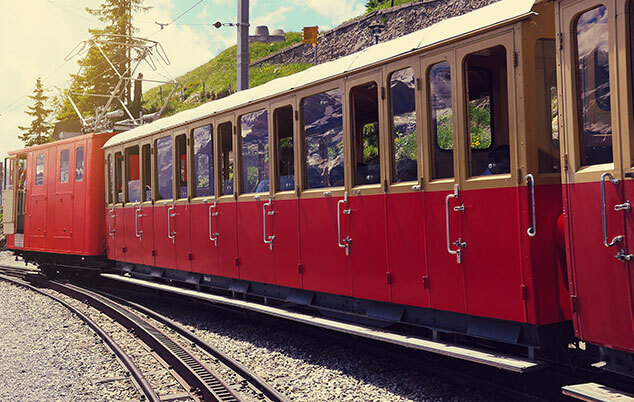 Offering scenic train rides to the Summit of Mount Washington, step aboard the Cog Railway and see the mountain like never before. Embark on this narrated three-hour journey up the steepest railroad tracks in the US. Pass through several climate zones and elevations before reaching the top. With magnificent views of New England and the surrounding mountain terrain, The Cog's rich history dates back to the late 1800's when this steam engine train made its first voyage. Passengers have one hour to get off and explore the Summit of Mount Washington, including the Sherman Adams Visitor Center that encompasses a snack bar, museum, post office, and 360° views of the surrounding areas including up to 5 states, Canada and the Atlantic Ocean. Trains run from mid-April through November. Train schedules vary per day, so please check their website for your dates. When should I arrive for my train? All passengers should plan to arrive at least 30 minutes prior to departure time to allow time for ticketing and restroom visits, as there are no restrooms on the trains. You may board 15 minutes before the scheduled trip, and seats are on a first-come, first-serve basis. It is suggested that all passengers use the restrooms, visit the gift shop, and dine at Marshfield Base Station prior to and/or after their excursion. If you arrive late, there is no guarantee that there will be room left on scheduled train, but can go out on the next available. How long is the ride on the Cog railway? The roundtrip journey to the summit of Mt. Washington Valley is 3 hours for a 9-mile run. With one hour up, one hour back, and one hour to get off and explore Sherman Adams Visitor Center, museum, gift shop, and post office, make sure to stop and take in the unparalleled views of New England and beyond from the highest peak in the US.